In ground basketball hoops might not offer the versatility that portable hoops do, but they often provide greater stability and durability. This review will highlight a few top-rated in ground hoops for your driveway, as well as a couple to avoid, before advising you what to look for during the purchasing process. Our research will enable you to find exactly what you’re looking for in your hunt for the best in ground basketball hoop. Is in ground basketball hoop installation complicated? Spalding H-Frame In-Ground Basketball System Review: Spalding is renowned for making some of the best products in basketball, and this hoop is no exception. With a 60” steel framed glass backboard, you can be sure that this product will last a long time. The 3/8” thick tempered glass backboard mimics professional backboards, meaning you will get more bounce with this product than with many of its competitors. The U-Turn Pro Lift system also enables you to easily adjust the hoop height between 7’ and 10’, so if you’re not quite as tall or athletic as LeBron, you’ll still have a chance to practice your dunks. The backboard is set 3’ in front of the square steel pole, so when you’re practicing these moves you won’t have to worry about crashing into the support – though even if you do, it’s covered by a Heavy Duty Spalding/NBA Pole Pad. This basketball system invariably comes in a little more expensive than some of its competitors, but considering it’s the best Spalding in ground basketball hoop available, it’s well and truly worth it if you can spare the cash. 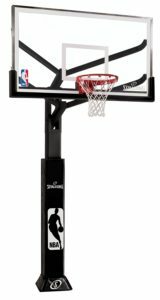 Silverback 60” In-Ground Basketball System with Tempered Glass Backboard Review: After reading this Silverback basketball hoop review, you’ll understand why so many basketball lovers go with this option. The tempered glass backboard is durable and high quality, and will enable you to rebound like Andre Drummond after your opponent misses a shot. The steel pole is adjustable, allowing you to set the rim from 7.5’ through to 10’, while the anchor mounting ensures that your hoop won’t be moving, no matter how hard you throw down your windmill dunks. Considering the quality of this product it comes in relatively cheap, and it is backed by a 5-year warranty, so you know that Silverback are confident you will get a long period of use out of it. Goalrilla GS54 Basketball Hoop Review: Goalrilla might not be a name everyone is familiar with, but that doesn’t mean they don’t make a good basketball hoop. The in-ground system is referenced as having the strength of concrete, but that doesn’t mean you can’t alter the position of the hoop if you’re unhappy with where it is. The option to unbolt and move the hope is still available, so if you really need to, you can set it up elsewhere. The rim height is adjustable from 7.5’ to 10’, and the steel pole is both durable and rust resistant, meaning you’ll get plenty of use out of this product. You might not know a whole lot about Goalrilla, but after reading this Goalrillainground basketball hoop review, you should understand why they’re beginning to make a name for themselves. 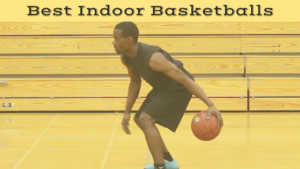 Lifetime Mammoth Height Adjustable In Ground Basketball System Review: As the name suggests, this is the biggest hoop made by this company, and it is also the best Lifetime in ground basketball hoop money can buy. Inevitably it is a little more expensive, but it is worth it, as you’ll get a number of years use out of this product. 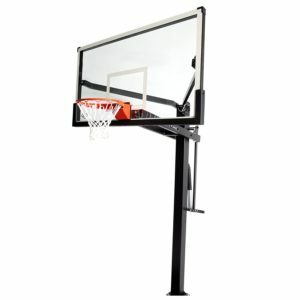 The steel-framed tempered glass backboard allows for NBA-style rebounding and increased durability, though it is only 54” wide, so some of your more angled bank shots might need to be reserved for a different hoop. Don’t let that deter you though, as there are plenty of redeeming features to this hoop. It’s 1-piece steel bolt-down pole allows for relatively easy installment and minimal movement in the hoop once it’s set in place, and the 35” offset extension arms ensure the hoop is a long way in front of the potentially dangerous steel pole. Lifetime 71281 In Ground Basketball System Review: Another Lifetime product, and though this one is of inferior quality to the Mammoth System, it is also much cheaper, and is the best in ground basketball hoop under $500. The 52” steel framed backboard is made of polycarbonate, which is one of the reasons the product is a little cheaper. Polycarbonate is generally regarded as shatterproof, so you’ll get plenty of use out of it, but you will lose out a little on rebounding, as the material is not as bouncy as glass. Aside from that though, it’s a great product and terrific value for money. It adjusts easily from 7.5’ through to 10’, and a friction-weld joint on the support pole ensures there is no movement when you slam home your dunks. It’s backed by a 5-year warranty, so you know this is going to last a long time, and when considering the price tag, this is a great value purchase. 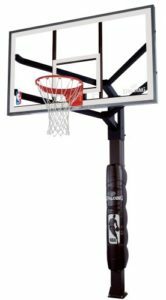 Lifetime 1084 Height Adjustable In Ground Basketball System Review: Lifetime makes a whole lot of in ground basketball systems, so invariably some of them are going to miss the mark, and the 1084 is one of those products. The smaller backboard makes it difficult to practice angled bank shots, and the backboard goes to more effort to look like glass than to act like glass, meaning your rebounding ability will be compromised. The price is reflective of the quality, so you will certainly save a little coin if you go for this product, but you will really lose out on quality. 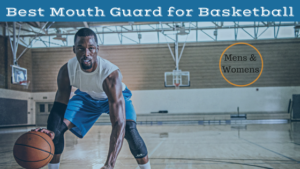 It is a little more appropriate for children, but even kids will probably grow out of this product and eventually demand a higher quality hoop, which more accurately reflects those they play with in a competitive environment. 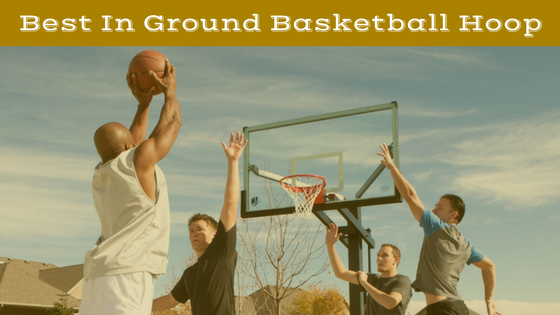 Spalding Arena View In-Ground Basketball System Review: The second in ground basketball hoop to avoid is in complete contrast to the first. This Spalding product is relatively high quality, but it is extremely expensive, and there are better options available at a lower cost. This hoop has all the perks of a high quality hoop, with a glass backboard and adjustable height to name a couple, but there are some problems, which make the cost not worth it. For starters, it is very difficult to install, and once in place no adjustments can be made. Many users also complained about its durability, claiming it began to rust and lose quality within a couple of years. Given there are far, far cheaper products, which last longer and work just as well, don’t waste your money on this one. In ground basketball hoops don’t always come cheap, so before you buy there are a few factors, which need to be considered. The difference between a good value purchase and a bad value purchase is stark, so making sure that your investment in one of the best hoops for yourself or your child(ren) will perform as intended is a key example of these important factors. Among the others are backboard type, and ease of installment; both of these will impact whether you end up satisfied with your purchase. Cost: The reason this factor is such an important consideration to make prior to purchasing an in ground basketball hoop is because the difference in prices between different types of these products is so enormous. If you opt to buy a top of the range, all perks included in ground hoop, you could easily be looking at a cost well into the thousands of dollars. In contrast, if you go for something a little more basic, a couple of hundred dollars might be all you need. Clearly, which end of the scale you go for depends on how much money you’re willing and able to part with for a basketball hoop, but for most people, value will be the determining factor. Is the $2,000 system you’re looking at really significantly better than the $1,000 option? Or at the other end, will the $200 in ground hoop last for long enough and perform well enough to justify the purchase? Ease of installment: Considering these products generally stay in the same place once they’re installed, the installment process is inevitably relatively long, and sometimes arduous. Some in ground basketball hoops need a lot of people, and a lot of time and effort to properly install. Perhaps this isn’t a problem for you, particularly if the product is renowned for being of very high quality, but other people may not have the time or the motivation to complete this process. Other hoops are a little easier to install, though often these are more expensive, so there is a clear trade-off, and you need to decide whether you have the time and resources to properly complete a complicated installment process. Durability: This is one of the single most important factors to consider prior to your purchase, particularly if you opt to purchase one of the higher end in ground basketball hoops. If you’re going to spend upwards of $1,000 on a product, it’s fair to assume that it’s going to last a reasonable period of time. Many in ground basketball hoops offer five-year warranties, which is great for your own peace of mind and is a good sign that the company is confident in their own product. Some cheaper basketball hoops may appear like a good value option, but if they’re going to deteriorate within a year and force you to buy another one, you may end up paying just as much as if you bought a higher quality product to start with. Backboard material: Almost without fail, the more expensive products have a backboard made of glass, and this is because it is the best material to use for a backboard. It is the material used in the NBA, the NCAA, and virtually every competition around the world, offers the best rebounding, and is durable. Acrylic is the next material down, and while it still offers reasonable bounce for practising your boards, it does tend to scratch and deteriorate relatively rapidly. Poly-carbonate is the lowest quality material. It will last you for a long time, but the bounce is nowhere near that of glass, meaning you’ll have a hard time practising your bank shots on such a backboard. As noted above, this depends on which system you opt to purchase. 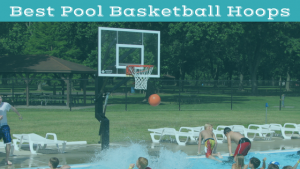 Some in ground basketball systems have extremely complicated installation processes, which will require you and a few friends to spend a significant period of time working to put it all together. Generally, cheaper in ground basketball hoops require you to insert the support pole into a deep hole filled with concrete. The problem people often have with this is that they insert the pole slightly off center, resulting in a hoop system, which is not straight. More expensive systems provide you with an anchor kit, which makes the whole process a little easier – you’ll just need some concrete. In ground basketball hoops are a great option if you’re confident that there is an appropriate place for you to put the system. Moving them is difficult, so once they’re set in place, they are generally there to stay. The benefits, however, is that they are stable, durable, and often very high quality, meaning you’ll get great use out of them. 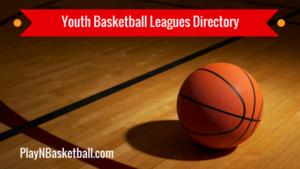 This article has detailed some of the best in ground basketball hoops on the market, as well as a couple to avoid, and also discussed the most important factors you need to consider before jumping in and making your purchase.